Another super easy card to make. It's all in the papers!!! The base of this card is a folded half-sheet of Calypso Coral. On top of that is a piece of Decorative Series Paper (DSP) from the "Delightful Daisy" 12" x 12" pack. I cut that piece 4" x 5-1/4". The next layer is from the "Whole Lot of Lovely" DSP. I cut that piece 1-1/2" x 4". The layer behind it is a 1-3/4" x 4-1/4" piece of Calypso Coral. The words are from the "Perennial Birthday" set. I stamped them on a 1-7/8" x 3" piece of Whisper White card stock. The layer behind it is cut 2-1/8" x 3-1/4". I stamped the words using black Memento ink and the center flower thing was stamped using Calypso Coral ink. The center word panel was set in place using Dimensionals. 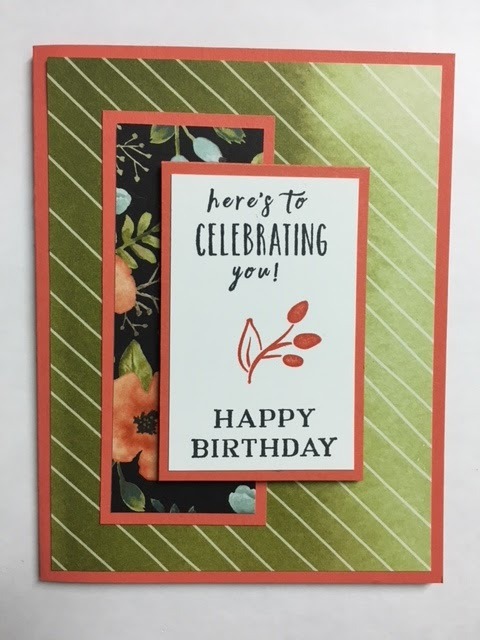 It's a very quick and easy card to make. I really like how the background looks on this card. That Olive Green has such a rich look.